"We've got a new order of 21 fifteen-minute segments, but they're gonna be combining those into thirty-minute shows. Be nice to get another twenty-one ... or even forty-two." And in the next building over on Third Street, Nickelodeon has two DreamWorks Animation TV shows in production: Kung Fu Panda, and The Penguins of Madagascar. Penguins is finishing its final season. Though ratings are good, an artist told me: "DreamWorks Animation doesn't want to do a lot of shows, so when we finish this season's order, we're done." 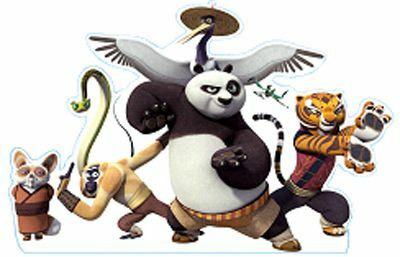 Kung Fu Panda, the series has yet to air. Word on the floor is that the episodes start rolling out late next Fall (after the second movie is at the end of its run.). Television Animation has been on a bit of a tear lately, with new shows coming into different production pipe-lines, and employment moving higher. Supply of talent still outstrips demand, but not as much as a year or three ago. Never good to come in "under estimates." My thought is that the monster opening for Hangover II crowded tne panda out of some of the marketplace. If the NBA finals had not ended early, and more males of the species had been at home in front of the flat-screen instead of in the multi-plexes getting their dose of the Wolfpack, the grosses might have been different for KFP2. Ah, but there are always many "if only" tales, even as there is only one reality. And the reality this holiday weekend was: the "have to see" live-action pic took the crown. Because questions have cropped up on the thread below, let me put up a few factoids about the industry pensions, as well as various pension options. Here are the benefits now received by TAG members working under TAG/IA contracts. 2) Defined Benefit Pension -- Employer contribution of $1.2665 per hour worked. 3) TAG 401(k) Plan: Employee contributions (tax deferred) of $16,500/ yr.; $22,000 per year for participants fifty and above. The IAP (Individual Account Plan) is a conservatively-invested MPIPP account payable to the participant at the time of retirement. The Defined Benefit Plan (also a part of the MPIPP) is a monthly annuity paid to the participant at the time of retirement. The Animation Guild 401(k) Plan is a tax-deferred defined contribution plan. Withdrawals can be made from the account without tax penalties at the age of 59 1/2. Obviously, these figures are projections and future events might cause them to be smaller ... or larger. What I can tell you is that there are a number of individuals in the 401(k) Plan who have between $300,000 and $400,000 after sixteen years of 401(k) Plan's existence. On top of that, contributions of $5000 could be made to a ROTH IRA account by many animation industry employees. So if you put your shoulder to grindstone and live below your means, you should be able to build up some sort of nest egg over the next quarter century. The Chinese are getting serious about animation. Kung Fu Panda, second iteration is now cleaning up at China's box office. And the Chinese government and others have admitted that having an American company execute a Middle Kingdom subject with such expertise ad aplomb is ... teeny bit irritating. They think they should be the ones doing it. And now it looks as though they're putting their money where their aspirations lie. So we'll see what happens in the next five to ten years. Because that's the amount of time, I think, it will take to create an industry that is world class. China is working to build itself animation infrastructure in different parts of the country. Seems as if some infrastructure might turn out stronger and better than other infrastructure. My old man (Ralph Hulett) was involved in the '41 strike. He was against it. He crossed the line and went into work, even though he was a low-level (and low-paid) Disney employee. What first motivated me to write Drawing the Line, was seeing how the studio histories skirted around the strike, like everyone was always one big happy family. But the artists themselves spoke of that strike as this traumatic event that was the defining moment of their careers. What I'm aware of is how events from long ago can have positive and negative impacts generations later. Because of what happened in 1941, I had high-quality health insurance as a little kid, and my kids had much the same. 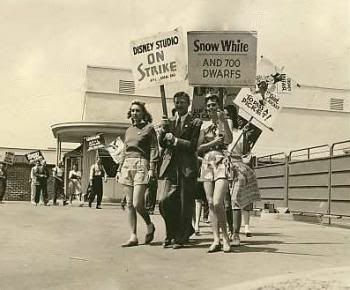 Despite the pain and disruptions seven decades ago, thousands of animation employees today enjoy decent retirements. None of these things are trivial. Jack Sparrow, he's still the top sea dog. ... [T]he weekend’s No. 1 box office crown went once again to Disney’s Pirates of the Caribbean: On Stranger Tides. Meantime, the serial imbibers and KFP2 opened well. As in the U.S. of A., Panda ran behind Hangover, but I don't know where they were competing head to head, or how the 5,000 screens of the live-action picture compares to the 8,000 screens of the animated flick..
... The Princess And The Frog reportedly cost around $105m to make, and took in $104m at the US box office. Elsewhere, it added $162m to its total, meaning from cinemas alone, it brought in $267m. Tangled's figures are scarier. Because, on face value, it did well. It took in $199m in the States, $389m elsewhere, and before it hit DVD and Blu-ray, it had grossed $588m from cinemas alone. The problem? The negative cost, before marketing and distribution, was apparently a staggering $260m. These are the kinds of commentaries that are crazy-making. Because despite the qualifiers ("apparently," "reportedly"), they give the impression that the public-record shows what this or that motion picture actually cost. Now, somewhere deep in the catacombs of the Disney Co. or Time-Warner or Viacom, some overworked accountant has a record of what amount of loot was spent on which picture. But nobody in InternetLand knows. Everyone is guessing. Entertainment companies cook the books all the time, for any number of reasons. It's been going on since the days of the Nickelodeon. Tangled may or may not have cost a quarter billion dollars. It all depends on what the studio chooses to tally. Development on the feature started while Shrek Uno was still a gleam in Jeffrey Katzenberg's eye, so the picture was in its gestation period a looong time. And there were a lot of salaries riding on Rapunzel's long, silky hair. But to the larger point (yet again): When somebody writes about how much a movie cost, or how much a movie made (and remember, there are various cash flows from lots of sources over lengthy periods of time) they are most likely using inaccurate data. Join noted compositors SARI GENNIS, CHRIS SIMMONS, GREG TEEGARDEN and others in a wide-ranging discussion of compositing, and how it has served as a transition craft for traditional animation artists making their way into the worlds of 3D and visual effects. Inactive members (suspended or withdrawn) may attend; they have voice but no vote in the meeting. Non-members should check in with the Sergeant-At-Arms; they may participate in the panel but not in the meeting. Will More Animated Film Options Mean More Female-Oriented Films? There's a pretty obvious answer, and I'm surprised it's escaped Mr. Hughes notice, him being at Forbes and all. Not unless studios sniff that there is MONEY in female-oriented films. Allow me to give you a quick, real-world example. There's a story guy at one of the animation studios who was developing a female-oriented movie. While he was puttering along, The Princess and the Frog came out, under-performed, and his girl project got shelved. Ah, but then the female-friendly Tangled burst upon the eyeballs of the movie-going public and over-performed. And the guy's girl project was resurrected. The moral of this story is: It isn't the total number of animated features being made that determine more Female-Oriented cartoons, but the success of the handful of girl projects that make their way into the marketplace. As always in Tinsel Town, it's about the cash-o-roonie, not about the political correctness. 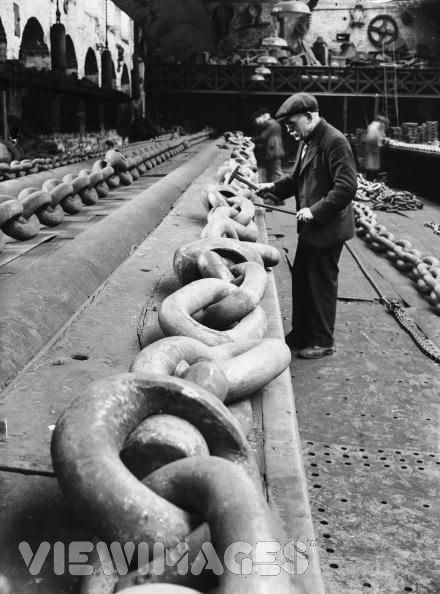 The linkage you crave, made with union labor. Pixar's Warrior Redhead is revealed. Then there are newer CGI features in Moving View Master. European low countries go after high-end animation. Hey, Boo Boo! It's time for Yogi Bear 2! Walt Disney Animation Studios' next moves ... per Den of Geek. Have a memorable Memorial Day Weekend. This, of course, fits the profile of a number of larger visual effects houses. They know there's not a lot of money in pumping up live-action movies with digital special effects. They also know that animated features are a hot commodity just now. You turn out a blockbuster cartoon, you can open your own mint. The only visual effects house now producing animated feature is Sony Pictures Imageworks, over on the Sony lot. Wonder how that's working out? Below the fold, some samples of our next show, opening in a week's time. Now with cheese-coated Add On! ... also those drunk guys. Looks to be a barn-burner of a holiday weekend. The Hangover Part II grossed $31.7 million as it opened at the domestic box office, nabbing the third best Thursday gross of all time. DWA is clearly on a roll. Four pictures in fourteen months, three of them hits. Not too bad, I'm thinking. I'd say that Hangover nicked the Panda bear a bit, but them's the breaks. Buy a merchandise franchise and make a movie about it. What a great idea! "When I got hired here to work on Planes, the execs made no bones about the fact that Toons was making movies to support a line of toys. No art for art sakes around here. I find that kind of refreshing after some of the other places I've worked at ..."
Art is all well and good, and we're for it, of course. But our fine conglomerates (and Chris Meledandri) know they're not under-writing renaissance artists' boutiques. It's About The Toys, Amigos. At the risk of chronic redundancy, when you work under the jurisdiction of The Animation Guild, you get three pensions. The first is a Defined Benefit Plan with a five-year qualifying period. When you qualify for it, you get a monthly check at retirement age. The third is an optional 401(k) Plan into which you can defer up to $16,500 of your annual salary. We talk and post about these pensions all the time. We hold weekly orientation lunches for new members where we expound on them in great detail. We put pension details on our website and in our newsletter. Even so, we get members who are astounded that they have all these freaking pensions. Sometime we feel like tearing our hair out, but we press on, letting people know the pension benefits that are out there, helping them to fight poverty in their old age. We feel it's our solemn duty as good union reps and upstanding American citizens. David Cohen sounds off on Dimensional Cinema ..
... and makes some important points and criticisms. For those with Variety subscriptions, please read the article. Mr. Cohen highlights what I've written before in this forum. Theaters are showing dimensional prints too dark. However, the article puts the root of the problem at the lack of a standard and the proliferation of different formats. Between RealD, Dolby and now Xpand, few directors and/or studios are taking the time to create the proper 3D LUTs* to ensure the movies are viewed the same in all theaters. 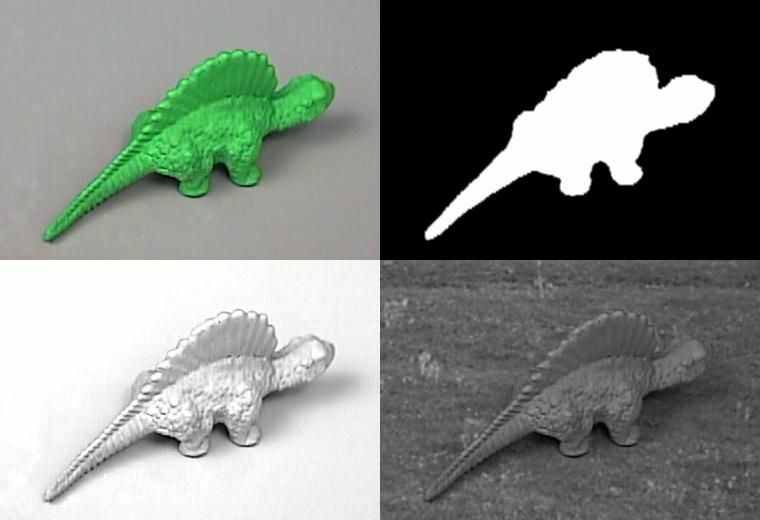 * 3D LUTs (lookup tables) are used to calculate preview colors for a monitor or digital projector of how an image will be reproduced on the final film print. Some have concluded long ago that stereoscopic cinema was nothing more than a ruse to get audiences to pay extra for tickets. Now, we're seeing how greed has blinded the studio execs to the most basic of principles of marketing .. get the audience to come back! Its all fine to charge a premium for a product that is superior to its predecessor. But to offer a superior product and deliver the dregs, is to alienate your customers and force them into finding alternate ways to entertain themselves. The lack of a standard for dimensional viewing is reminiscent of other format battles (memory cards for digital cameras first comes to mind) that have plagued our wallets. What's worse, there exists the Digital Cinema Initiatives to address this very problem. Mr. Cohen's article finishes with a quote from Cinematographer Guild Pres. Steven Poster that points out that movies shown in theaters have to match the quality (and clarity) of Blu-Ray and DVDs being released. If people begin to realize they're unable to see key elements or items on the screen because someone didn't care enough to ensure a maximized theatrical experience, audiences will begin to vote with their wallets and choose the little disc over the plush seat and bag of popcorn. ... [W]hen Brenda Chapman was fired from Pixar's "Brave," it stung not just Chapman but also her female colleagues in the animation community. There are varying industry stories about Ms. Chapman's departure from Emeryville, but it's interesting that the L.A. Times airs this linen on the same day it profiles Jennifer Yuh Nelson, no? Management at Pixar/ Disney is fond of saying how the pictures are "director driven" and it's all about the "director's vision," etc. To some degree that might be true, but when the director's vision collides with the ideas of the head of the studio, all of a sudden the director isn't driving anymore. Everybody knows this to be true. It might be useful if management admitted to the reality. *Click to listen in your browser. Right-Click and Save to download to your computer to listen later. Fifteen years ago, I talked to an effects supervisor at Disney who thought the viz effx business had become cutthroat, what with congloms putting tentpoles out for bid to the least expensive sub-contractors available. And salaries and working conditions beginning to get squeezed. It's nice that VES is putting out press releases regarding not-great working conditions, but where have they been the last fifteen years? The problems aren't new, and aren't going away anytime soon. And labor unions -- ours included -- have been slow off the dime. Just today we received an e-mail from a member working in visual effects who says the old-timers get the usefulness of being in a labor organization but the younger crowd's attitude is "Eenh. Who needs this?" In those days, she was fresh from Pennsylvania, without money or contacts in the business or very much artistic training. 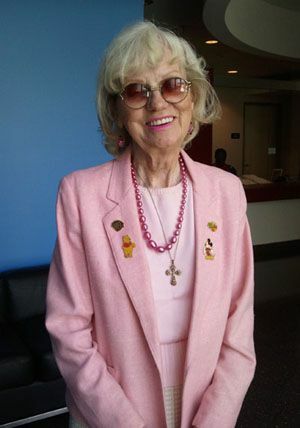 One bright morning on the Disney lot, she encountered Walt Disney. He asked her, "What are you doing here so early?" She answered, "I get here early every morning, Mr. Disney. I have to, because I hitchhike to work." Ann was eighteen at the time. And Walt Disney was surprised. Me: Hello, Animation Guild. May I help you? Her: Hi, do you guys do vaccinations? Me: Umm, no, we're a labor union. Her: Oh ... I'm sorry, you're the Animation Guild. I thought it said "animal vaccinations". Sorry, bye! A handful of animated features now accounts for over one-tenth of box office revenue. Compare this to a couple of decades ago, when animated features were sad little outliers that made a few bucks for Disney. Which the rest of the motion picture industry studiously ignored. My, how the landscape has changed. Now, every conglomerate in the entertainment universe is clawing its way into the animation horse race -- Disney, Viacom, Universal, Time-Warner, Fox News Corp. The reasons' simple. In 2011, when you get an animated extravaganza that takes in $150 million during its domestic run, industry wisdom says that the movie has under-performed. Take, for example, last year's Megamind, from DreamWorks Animation. It made $148.5 million stateside, and $25 million more than that total overseas. And a short while later, stock analysts rolled out to proclaim the film a "disappointment" and the reason they were downgrading DWA as a stock buy. Over the past two years, TAG's membership rolls have steadily grown. This isn't because our organizing has reached a fever pitch, or companies have gotten altruistic about "going union," or Southern California has recaptured all the overseas work. It's due to the fact that animation has become a safer bet for making money than most genres of live-action film. And so the labor market for artists, animators and technical directors trends ever upward. Nobody, of course, knows how long this direction will last. California entertainment employment has changed a lot over the past five years. Live-action movies have shifted to other states and other nations. CGI work has mushroomed in India, New Zealand and other places. But the fact remains that L.A.'s animation work force continues to grow, and as long as the world's audiences keep flocking to the movies of Pixar/Disney, Blue Sky Studios, Illumination Entertainment and DreamWorks Animation, peak employment is not yet in sight. I could imagine the film breaking the billion dollar mark (though given the summer competition, I don't think it's a foregone conclusion.) But I can't see it taking in much below $750 million. The Hangover is going to cannibalize a minimal number of Panda tickets, and both films will open big domestically, with KFP2 ultimately doing a multiplier of 4+ of its opening weekend. Now we sit back and wait. And see how much of Hulett's head is buried in Hulett's large intestine. These Hollywood people. You can sneak nothing by them. Pixar Animation will be following that formula to a degree this summer, localizing "Cars 2" in six countries by subbing in a different car for a scene that takes place at a Tokyo party. Overseas markets make up the bull-gorilla's share of theatrical grosses these days. And when you have an America-centric animated feature (can we say Monsters Vs. Aliens?) the foreign box office grosses go into a swoon. DreamWorks has two non-American features coming out in 2011, both filled with fuzzy animals in exotic locales. DWA clearly doesn't want to make the same mistake -- humans in large, domestic metropolitan areas -- during back-to-back years. The Mouse has glad tidings. A week ago, I got an e-mail from a member complaining about a financial advisor he had briefly engaged. Apparently the "Financial Advisor" (otherwise known as a "wizard") had advised our member, but when the member didn't like the advice and asked for his deposit back, the advisor said "So sorry, the money is non-refundable." At which point the member said: "Uh. What document did I sign actually say that?" Financial wizards have their place, I suppose. If you have no knowledge of stocks and bonds, and tend to glaze over when somebody within speaking distance talks about "asset allocation," "risk premiums," and "small cap vs. large cap," then maybe you can hire yourself a wizard who charges by the hour and will help you set up an investment program using low-cost stock and bond funds. But under no circumstances should you run out and jump on the bandwagon of an f.w. who charges one or two percent off the top and works on commission. The game is rigged enough as it is. Mostly, investing for retirement is simplicity itself. You just have to own the will to believe it and do it. * Pay particular attention to "Implementing an Investment Plan." A few links to your animated reading (and viewing) matter. The L.A. Times asks: Spielberg's Tintin. Is it animation or is it mo-cap? Pixar and Blue Sky Studios know it's about foreign markets. Fox knows how to tweak Simpsons' numbers. John Lasseter shows off his extensive wardrobe. Oswald the Lucky Rabbit gets a new film score. The Daily News objects to the oncoming Flintstones Do-Over. DWA's Panda gets marketed through Zynga's Cityville. The L.A. Times features Walt and the Pirates. Mr. Depp and company might be under-performing domestically. Meantime, Rio, the only animated feature in the Top Ten, flaps along in 7th place. The flock of South American birds currently has a world accumulation of $435 million as it makes its way toward the half billion dollar mark. This A.M. I tottered onto the DreamWorks Animation and visited multiple floors of the Lakeside Building, lining up future TAG interviews, pushing 401(k) enrollment forms and books on people, and seeing what's going on, production-wise ... .
"The studio had a really positive test screening. They are going to do some tweaking of the third act, but people think the feature's in good shape. It's got a different vibe than Shrek, a little bit rawer. But then the cat is wilder, isn't he?" I replied that if it performs up to hope and expectations, DWA's got another series on its hands. On the cave-man front, J. Katzenberg has (allegedly) signed off on the latest story work on the The Croods, and a few production people have told me they're facing hiatuses (hiati?) until the picture returns to fuller production later in the year. The moral: Go to the movie and make up your own damn mind. Don't let other minds, clouded by repetition, decide for you. Lastly. In the afternoon, after lunch, I visited Disney TVA in the Frank Wells Building. Uneventful. Except a guy in one of the wall offices looked up from his computer as I stood in the doorway and said: "Move along." This is slightly off-topic in terms of being animation specific, but completely on-topic in terms of speaking about how jobs not attached to a graduate degree are now thought of in the U.S. of A. When I broke into animation, the "skilled industry veterans" were people highly qualified at the craft. But funny thing. They were men (and sometimes women) who had been working in the business since high school ... or their initial two years of art school. There were not many people running around with Masters or PhDs. They just knew how to draw ... how to paint ... how to design and animate and create their movie art like wizards. Arthur Christmas is in its final stretch, and board artists are working on Hotel Transylvania, (some now in their third or fourth year). Some work remains on Smurf movie DVD extras. And three artists told how much they enjoyed the Walt Peregoy interview. Added to which, several voiced a wee bit of under-enthusiasm for the current SPA management team. "We've got a guy heading the division who's got no experience in animation, doesn't know much about it. And I don't think he or any of the rest of them really know what they want. Or where they want to go." But hey. As long as they keep paying me, I've got a job, you know?" But the discussions I got into at the hat building weren't about Disney features. The main thing that came up was whether 48 or 60 frames per second would ever catch on. Nobody seemed to think so. "Too expensive" ... "The studio bean-counters would never go for it" ... "Maybe 60 fps for action sequences" ... "Maybe they'll go for it if the new Peter Jackson move ["The Hobbit" -- at 48 fps] makes a lot of money." Tomorrow I'll hit studios closer to the office. DreamWorks Animation has been ahead of the curve. The first female and first Asian director at DreamWorks says she was able to bring a new type of collaborative leadership. “Certainly one thing that was nice about being the first Asian female director was that there were no expectations of what I would be doing, about what my style would be, so I could make my own,” Yuh Nelson told reporters in Seoul, Monday. The Korea Times has it a bit wrong on the "female" angle. Jeffrey Katzenberg has run animation studios and divisions that have put women in positions of authority for quite a little while. There was Brenda Chapman as story director on Beauty and the Beast (and then co-director on Prince of Egypt.) There was Vicki Jenson on Shrek and Shark Tale, and Lorna Cook on Spirit. Kathy Altieri as production designer on How to Train Your Dragon and multiple other DWA features. And then of course Jennifer Yuh Nelson as story director on Kung Fu Panda and now director on Number Two. Say what you like about Katzenberg, he's pretty much the only animation studio top-kick with the balls to put women in the high seat over and over again, and actually leave them there to finish the job. There might be somebody else somewhere who's done it, but I can't think who they are*. Long and short of it, nobody comes close to Jeffrey's record on this score. 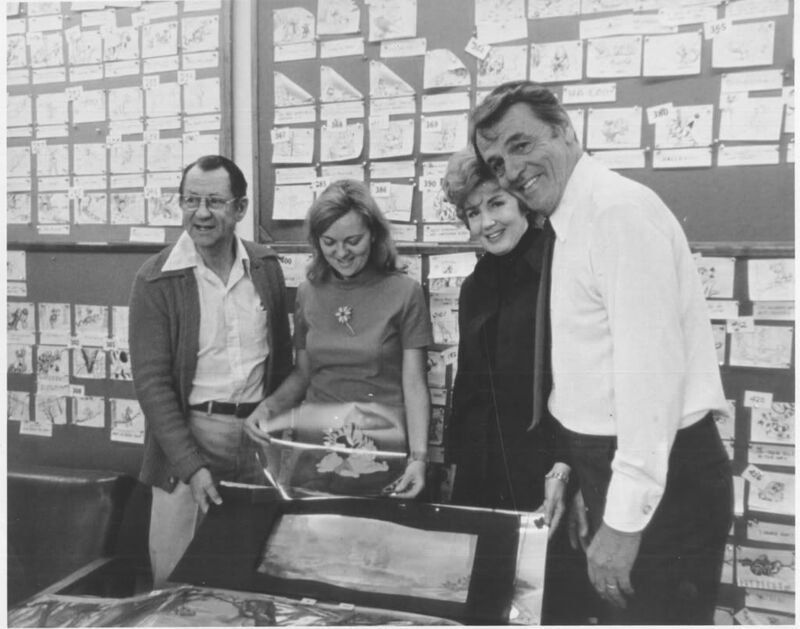 * Add On: Now that I think of it, Ms. Jenson also served as Production Designer on the Bill Kroyer film Fern Gully. A followup to Steve Hulett’s post from yesterday. Whereupon the receptionist burst into tears. Alice, it seems, was considered a border-line harasser by studio recruiters. This happened long enough ago that the studio in question no longer exists. And at many studios, neither does the hiring system that allowed Alice to actually speak to someone on the phone. Nowadays, to apply for a job at many if not most larger studios, you go to a website and/or send an e-mail to a generic address. If employers are to be believed, a large reason for the necessity of this is the sort of applicant abuse that may have occurred in this situation. Websites don’t cry. The thing is, I don’t really believe this. There aren’t that many applicants behaving that badly. I think most people are smart enough to know that making the receptionist burst into tears at the sound of your name is not a good job application strategy. A depersonalized application process isn’t necessary to protect management from the raging mobs with torches and portfolios. The now-common ways of doing things in the world of artist recruitment have resulted from what Steve wrote about yesterday -- the triumph of lowered demand over high supply in the labor marketplace. Too many applicants, not enough jobs ... it’s easier (and cheaper) to set up a website and a process to prioritize insulating the employer from the unemployed, rather than pay someone to communicate to potential employees. It is worth noting that Article 19 of the contract (pages 45-46) gives employers wide latitude as to whom they hire and how they hire them. We have never been a “roster union”, and I have never believed that a roster would solve more problems for the membership than it would create. The Guild has insisted on an ongoing dialogue with employers regarding abuses of application and testing processes. We haven’t given up on this issue; as always we need support from the membership to give us the leverage in pursuing solutions that stick. I have been generalizing here about employer abuses; a number of our employers, large and small, actually have artist recruitment people on the inside who are willing to talk to job applicants on the outside. And much of the anger and bitterness Steve and I hear from members comes from the general frustration of finding work in hard times, even at studios that treat all job applicants fairly. Of course, the point of having an employment application process is to insure that the best applicants are discovered ... as opposed to, let’s say, the ones who are merely willing to work for less. It's often overlooked how animation drives merchandise here and around the world, from the early days of Mickey Mouse until now. It's not just about the theater tickets, the DVDs and the Blu-Rays. Director Zemeckis takes a new/old path. "Cartoon baby" sounds like we might see another Disney project drawn by hand, yes? That would make a lot of animators (and assistants) who love the old style happy. A while ago, I got a call from a an artist who was a bit agitated. "I submitted my portfolio to [Studio X] and the contact person told me I couldn't submit anymore! What right does he have to do that? And he yelled at me too! You've got to do something about that!" I encountered the "contact person" outside the studio's front door. I happen to know him, and consider him a decent, even-tempered guy. He's the assistant to a studio exec, the employee whose job it is to receive resumes and portfolios. He passes them along to directors who are staffing shows, and usually his job goes smoothly. But he'd gotten into an argument with the artist who called me. The man, it seems, had made multiple portfolio submissions over a three-month period of time, to the point where directors were telling the Contact Person: Hey, enough already! I've seen this person's work four times! I don't need to see it again!" And the contact person, on the fifth round of portfolio submission, had told the artist he was overdoing it, and an argument ensued. "Yeah, I'm probably pushing too hard. And I was maybe a little ... ahm ... belligerent on the phone. But it's tough, you know? I've tried a bunch of studios, and I'm getting nowhere with getting hired. I need work. It's very frustrating." I suggested that he might want to revamp his portfolio, since his current samples didn't seem to be getting him bites. He agreed that was a good idea. Back in the late eighties and early nineties, the sleepy subset of the movie and television business known as animation exploded. Disney had wild success with a string of animated features (maybe you remember) and multiple studios jumped into the game. All of a sudden, the demand for qualified employees outstripped available supply, and two things happened. So what the hell's happened over the last decade and a half? And what does the landscape now look like? * Hand-drawn feature animation's boom years were short-lived. Disney competitors couldn't replicate Disney's success at 2-D features, and Disney couldn't sustain its run of blockbusters. By 2000, employment at studios doing traditional, long-form cartoons was down by 60%. * Television animation continued (and continues) to have a good amount of production, but supply long ago caught up to demand. Many displaced feature employees migrated to t.v. work, and the talent pool expanded to the point where studios didn't feel the need to hang onto staff during slack periods. Or pay sky-high salaries. * Fees for syndicated animated fare shrank precipitously, and the glory years of "The Disney Afternoon" and the Warner Bros. Animation bloc on broadcast television went away. This put more of a squeeze on industry hiring and pay levels. * Digital technologies surged to the forefront of feature animation. People who were wizards with Maya, Renderman and other software were in high demand (but even here supply caught up to demand.) Artists adept only with paintbrushes and pencils found themselves faced with long stretches of unemployment. In television animation, paper storyboards became a thing of the past -- Cintiqs are now at almost every work station. Today, almost every studio has screening processes for artist-hires. They want portfolios submitted on-line, and they want tests to be taken. The Animation Guild has no objection to tests in principle -- an employer has the right to ascertain that portfolio submissions are the work of the submitting artist -- but we have strong objections to long tests where artists crank out lots of board panels for free. It's been relatively easy to get studios' general agreement that long tests are a no-no. It's been next to impossible to get studios to stick to the concept, because upper management pays no attention to what this or that show-runner is doing down in the bowels of production. And if longer tests creep back into the game plan, most execs are unaware (or perhaps semi-aware?) of the problem. So what we have today is an industry with employment for folks with the right skill sets, but a number of hurdles to jump through before getting onto studio premises and into the cubicle. Artists working in the biz find out about jobs the same way they have for fifty years: some contact us, many network and share information with co-workers, some just march up and pound on doors until one of those doors pop open. Facebook, blogs, and e-mails are now a part of the mix, but the basic dynamics remain the same. There's got to be a job opening, and an applicant has to own the talent and skill to fill it. That was true in 1931, and it's still true seventy years later. You may have noticed there's no new podcast up. It was all going like clockwork for awhile, but then a cramped schedule intruded on my well-laid plans, and so ... the cupboard is empty. By and by the interviews will resume. But I make no promises about exactly when. The former Disney animator and character designer won't be doing the live-action sequel/prequel to Sleeping Beauty. Too bad. I think it would have been kicky to see Mr. B. 's take on the story. Would he have followed Eyvind E.'s design lead or taken the picture elsewhere in terms of visuals? Alas, we'll never know. But Ms. Woolverton is (apparently) still on the case. Seth MacFarlane is getting into the Flinstones business. "One of the first things that I drew when I was 2 years old was Fred Flinstone," MacFarlane told a roomful of ad buyers gathered in New York on Monday. Fox Entertainment chief Kevin Reilly said the series came together in the past couple of days and will begin production right away. The Flinstones will premiere on Fox in 2013. This follows recent animated orders Allen Gregory and Napoleon Dynamite, which will roll out in the fall and midseason, respectively. Its always good to hear that our signatory studios are vying to capitalize on what's working while discovering new and, well .. not so new, ways to increase revenue. We'll be interested in seeing Mr. MacFarlane's interpretation of the Flintstones family and friends, as well as all new productions at Fox TV Animation. Seems there was a do in North Hollywood for a number of Valencians. On Thursday night, CalArts presented its annual Character Animation Producers' Show, which showcased some of the best of the best from this year's students. Twenty-three cool, inventive and oftentimes funny shorts played to a packed audience at the Leonard H. Goldenson Theatre in North Hollywood. I went to a number of these presentations, back in the merry nineties. I was always impressed with the level of creativity, talent and all-around joie de vivre the shorts displayed. Animation studios were hauling the films' creators away to full-time employment shortly after the theater lights went up, many of them long before graduation. As to the number of animators/creators who get spirited away now, I've no idea. ... Where the parrots continue to frolic. What percentage of my net growth is going to fees in a 401(k) plan? ... [A]n individual who is 20 years old today ... has about 45 years to go before retirement -- 20 to 65 -- and then, if you believe the actuarial tables, another 20 years to go before death mercifully brings his or her life to a close. ... If you invest $1,000 at the beginning of that time and earn 8 percent, that $1,000 will grow in that 65-year period to around $140,000. The point Mr. Bogle makes is that over time, high fees in a 401(k) Plan or Mutual Fund can eat you alive. One or two percent sounds relatively small, but when you multiply that over thirty ... forty ... forty-five years, the magic of compounding allows those percentages to eat you alive. In my reckless youth, I didn't get this concept at all, and so I allowed a "Financial Advisor" to take two percent of my total nut right off the top. And over time my total assets were gnawed down a lot. As John Bogle points out, if you're into saving and investing for the long haul, low fees are essential, otherwise your returns will take a major hit. But go read the interview linked above. Bogle pinpoints a lot of the problems faced by young investors (workers?) socking money away in a choppy environment. Rio doesn't look to be a monster in its stateside incarnation, but overseas it's at the $300 million level. Fox will probably be staying in the feature animation business. The Walt Disney Family Museum of S. F.
The museum has ten galleries on two different floors, arranged in the chronological order of Walt Disney's life. We meet Walt's family, we see Walt's early life (with Walt narrating same.) There are the childhood jobs of candy butcher and newspaper delivery boy; there is his time as an ambulance driver in Europe near the end of World War I. Then it's on to a career in cartooning in Kansas City, and when that doesn't pan out, a train trip to Hollywood without money or many prospects at the ripe age of 21. One hell of a lot of thought went into the museum's presentations and layout. The early exhibits, showing Disney as a working class kid struggling to get a toe-hold in Tinsel Town, are displayed in spare, simple brick spaces. As the years roll by and the Mouse House prospers, the exhibits become increasingly elaborate (a fine and subtle touch.) You could easily spend eight hours submerging yourself in the artwork and audio, in the film clips and t.v. interviews and interactive nooks and crannies that the Disney Family Museum has to offer. Sadly, the Mrs. and I only had four hours. So what I'm telling you is, take a full day and explore the place, linger at the cases glittering with Oscars and gawk at all the flat-screen monitors. Listen to Walt's spoken memories. You'll find that it's time well spent. I haven't seen the show, but I've listened to Warner artists over the last few months and read some of the reviews. Whether or not TLTS is the ultimate reboot for Bugs and Co., it's always nice when a show fulfills rating expectations. It means that artists will keep working ... and our fine entertainment conglomerates will be more willing to underwrite more animated projects. I confess to the occasional mixed feeling on the subject of Google Doodles, those often funny and sometimes moving little animations (sorry) that pop up on the main search page on various occasions. On the other hand I was very taken by Wednesday's entry, not just because it comes from TAG member Ryan Woodward but because it so elegantly honors the 117th birthday of Martha Graham. A Washington Post writer offers his favorites. As many of you have probably noticed, the site has been inactive since sometime early Wednesday. 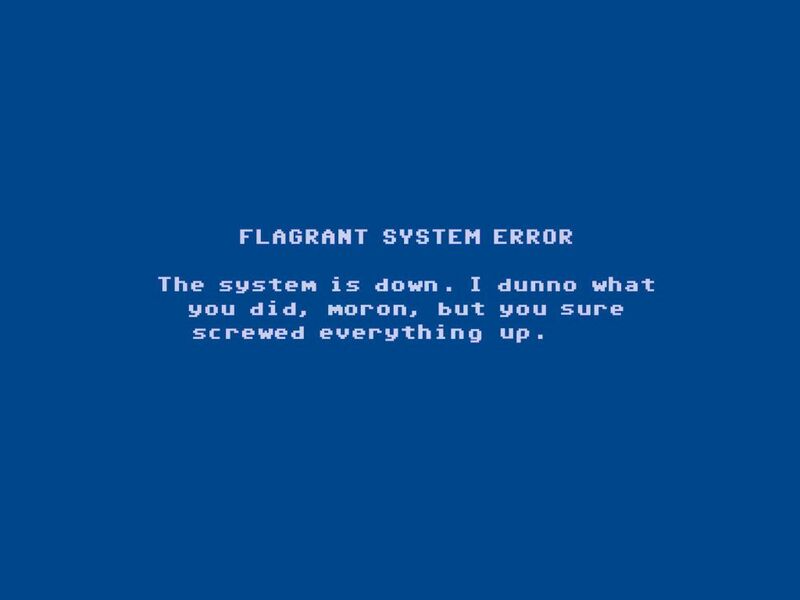 It was a system-wide issue with Blogger.com; for most of the period we were getting error pages when we tried to post, although a few times I couldn't even get back on the page. Crossing our fingers that all is better now. Resume your previous activities. When people complained to us about their personal service agreements being truncated, TAG was pleased to provide legal advice, and we helped a sizable number of vid game workers get larger payouts from the Mouse. This happened long ago in the glorious nineties, when Disney Feature Animation and Disney Television Animation were near their pinnacles. History might not repeat itself, but for Disney Interactive, it seems to be a rhyming couplet. **Now with freshly scooped Add-On after the jump ..
AWN reports on the announcement of the nominations for the National Academey of Television, Arts and Sciences Daytime Emmy Awards. In the article, they have listed the animation related categories and their nominations. Congratulations to all TAG members and signatory studios recognized for your efforts! Congratulations to TAG members Vince Toyama, Christophe Vacher, and Kaz Aizawa! The latest entertainment industry conference was held in Stuttgart, Germany last week. FMX, which started as a local biennial gathering for students, has grown into an annual "must-attend" meeting for anyone interested in animation, visual effects, games and interactive media. Two notable speakers at this year's conference were visual effects supervisor and recently re-elected chairman of the Visual Effects Society Jeffrey Okun, and former LucasFilm executive, Digital Domain founder and latest visual effects industry blogger Scott Ross. “What only matters is what ends up on the screen. Nobody will ask you whether everybody had a great time or you barely made it out alive.” ... "[A]lways be aware of the agendas and politics of the people around you." Scott Ross' contribution to the conference was a report on his views of the current state of the visual effects industry and where he foresees its future. He restated his views on the non-viability of visual effects studios due to unattainable profits, high cost of vfx artist salaries, overseas tax incentives and outsourcing. His solutions center around studios following the example of Pixar and Dreamworks in capitalizing on full ownership of content. [Mr. Ross] then points out that on a list of the 20 biggest box-office movies, one is CG animation and 19 are blockbuster visual effects films – and there’s only one really bankable ‘film star’: Johnny Depp. The next 20 entries feature two CG animated movies and 17 VFX movies. After digesting the two points of view offered from these industry veterans, the option of collective representation for visual effects artists becomes abundantly important. Mr. Okun points out the Industry Is Crazy and doesn't much care about you. Mr. Ross points out VFX Drives Sales and vfx studios need to be desperate in their strategies to stay viable. The contract achieved through collectively bargaining with visual effects artists through the IATSE would help protect against the insanity that is prevalent in the visual effects world. By delineating workplace standards and providing portable health and pension benefits, visual effects artists would construct a shield for some of the Crazy Mr. Okun describes. We have argued that signing an IATSE contract could be a cost savings measure to a visual effects studio. Having recently been shown that studios will find necessary funds to complete visual effects when necessary, a union contract with contributions for portable health and pension benefits may now also be a line item cost that vfx studios can add to help shore up profits, thus addressing Mr. Ross' viability concerns. The IATSE will not be the golden key to solving the problems highlighted by the two presenters or that are prevalent in the industry today. We will be a large factor in providing a stable, healthy and long-term industry to the artists who strive to succeed within its ranks. We feel this is an important factor in remaking the industry and invite all artists to take part. BroadcastingCable.com reports that Fox has signed up for a tenth season of Family Guy and a fourth season of The Cleveland Show. Hardly surprising, but renewals are always good news. Congrats to everyone involved. Viki counts her time on The Iron Giant as one of the most rewarding parts of her career, while Kurt looks back at his eight years at Walt Disney Television Animation as among the most enjoyable in the business. Both are amazed at how much animation has changed from the time they walked through the doors of Hanna-Barbera. 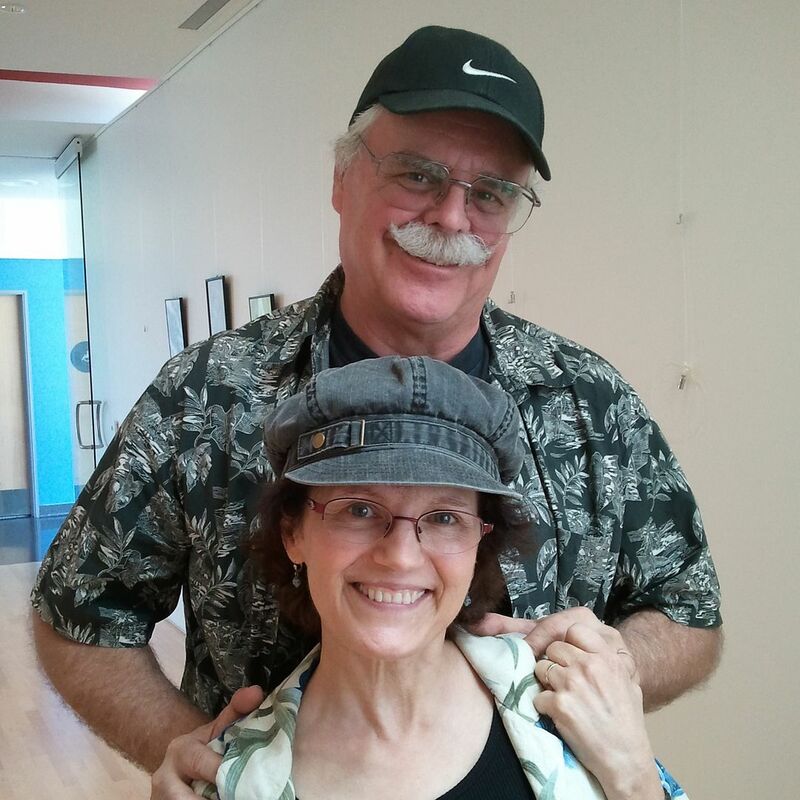 ... two-headed cartoonists were king last Friday as "The Two-Headed Cartoonist," a show of comic and fine art by members of the Comic Art Professional Society, opened at Gallery 839. 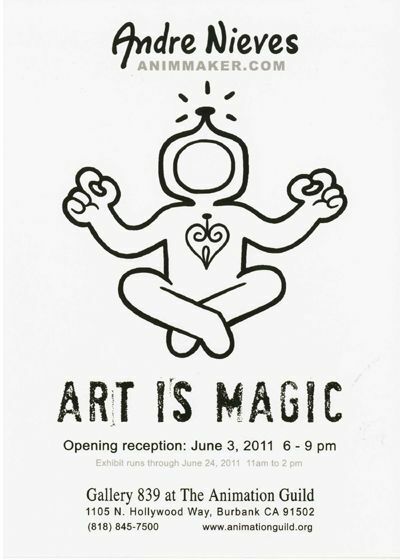 The show can be seen on Friday, May 13, 20 and 27, from 11 am to 2 pm. Coming up in June: the work of André Nieves. Kurt is an east-coaster, educated in Rhode Island. He came west with a buddy and landed a job at Hanna-Barbera five minutes after they got a look at his portfolio, and he's been working at a board-artist, director and layout person ever since. What makes a strong Union ..